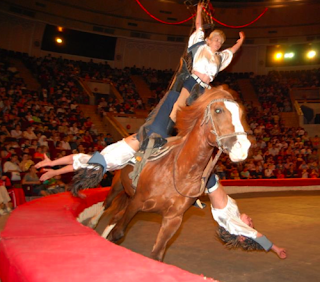 Uzbekistan has a long and rich circus tradition. Wandering actors, travelling along the Silk Road, performed in towns and settlements and were especially welcomed during festivals. They usually performed on central squares adjacent to the market area. In the centre of the improvised stage they set up a dor - a construction of ropes and the trunks of poplar trees - designed for the dorboz, or rope walkers. Then the performance was announced by loud playing of karnays and sunrayas, the Uzbek wind instruments, accompanied by drums and tambourines. 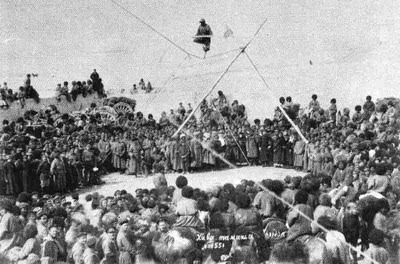 The rope walker appeared on a thin rope, high above the spectators' heads, doing difficult and risky acrobatic stunts. At a height of up to 25 metres and without safety equipment, the dorboz, sometimes blindfolded, walked, ran, and did the splits. As the crowds gasped, the performance continued with jugglers, stilt walkers and 'wisecrackers', who entertained the crowds with jokes and poems. As these performances evolved, animal trainers and illusionists joined the shows and, drawing on superb horsemanship honed for centuries on the Central Asian steppe, equestrian events were added. 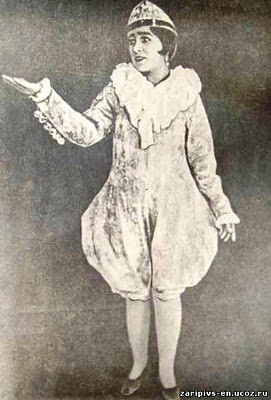 The modern Uzbek circus emerged in the early 20th century. In 1904 the first professional troupe was created in Uzbekistan, and the first permanent building was constructed in Tashkent in 1914. Later, in 1976, the blue-domed Circus was built and then fully renovated in 1999. Tashkent is host to the State Circus College, whose mission is to train performers, promote the centuries-old history and rich traditions of the Uzbek circus and to organize tours around the world. Several dynasties dominate the circus profession in Uzbekistan: the Tashkenbaevs, the Zaripovs, and the Khojaevs. While continuing to innovate, these families ensure that the secrets of the ancient and original arts are not lost. The Uzbek circus has become a full member of the world circus community: the artists have carried the flag of independent Uzbekistan through the arenas of more than thirty countries. In March 2011, the extraordinary rope walkers of the Tashkenbayev dynasty took part for the fist time in the prestigious Golden Circus festival in Rome and won the Grand Prix, the Golden Coliseum. Uzbek circus performers are so respected for their skills, that they are frequently invited to join other circuses. 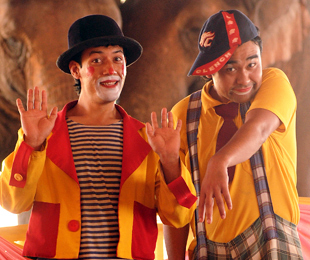 There was a recent article in the Bangalore Mirror about Khamarshah Mostov and Elnur Imomnazarov, two graduates of the four-year degree course in acting and circus arts at Tashkent's Circus College; they graduated in juggling and acrobatics and are now under contract to India's Gemini Circus. They were inspired by the film Mera Naam Joker, in which the Indian actor, Raj Kappor (who was wildly popular in the USSR) played the clown. In Khiva there is generally a chance to watch a breathtaking rope walking performance in the courtyard of Mohammed Rakhim Khan Madrasa. And if the circus is one of your passions, perhaps you will spend an extra day or two in Tashkent to catch a show? Generally performances are only on Saturdays and Sundays. Visit the website (Russian only).